Calcium is most commonly noted as being a crucial mineral for strong bone development. 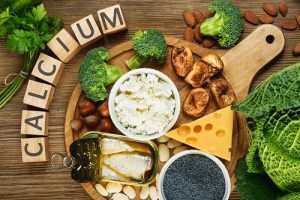 However, at our dental office in San Diego we also know that calcium is an essential part of building strong and healthy teeth. But just how much calcium does your family need? Before we dive into how much calcium each member of your family needs, let’s take a quick look at why a steady intake of it is important. Our bodies need calcium in order to function properly, and our systems will pull what they need out of what we have in our bones. In fact, the calcium found in bones and teeth is repeatedly removed, and it needs to be replaced. This is where eating a diet high in calcium helps replenish what’s lost. This is particularly important in young children when bones are developing and growing, and for older adults. The appropriate amount of calcium varies depending on age and gender. Here are the recommended daily doses according to the Food and Nutrition Board (FNB). Remember, besides eating a diet high in calcium, it’s also important to eat a variety of food groups at every meal. At our San Diego dental office, we’re in the business of taking care of your family’s smiles. One way to ensure a lifetime of strong, beautiful teeth is to get the recommended daily amount of vitamin D and calcium. And of course, we always recommend proper brushing and regular dental visits. Manual or Electrical Toothbrush ? Which one is better? How Much Sugar is in Your Favorite Treat? Rejuvenate Your Smile with All-On-4 Implants ! Is Asthma to Blame for Cavities?